Stress takes its toll on the human body in many ways. It can cause heart palpitations, head and stomach aches, sweating and irritability. Some people overeat while others lose their appetite. For about 10 million Americans — many of them women of childbearing age — stress causes severe jaw pain, a condition called TMJ Syndrome. The term refers to a host of problems affecting the jaw muscles and temporomandibular joint, the hinges located adjacent to the ear that connect the lower jaw to the temporal bone at the side of the head and allow freedom of movement to chew, speak and swallow. TMJ symptoms include jaw muscle tenderness, difficulty opening the mouth, jaws that lock and a clicking or popping noise heard when opening and closing the mouth. Although TMJ isn’t new, it continues to be poorly understood, says Jennifer Haythornthwaite, a professor of psychiatry and behavioral sciences at the Johns Hopkins University School of Medicine. In women 25 to 55, TMJ often is associated with depression, anxiety, sleep disturbances, gastrointestinal symptoms or frequent infection. The National Institutes of Health is funding at least six clinical trials of potential treatments for TMJ, from an injected arthritis medication to acupuncture and even spiritual healing. In Baltimore, two NIH-funded studies are evaluating pain management for TMJ and the interaction between TMJ pain and sleep disorders. In the first study, funded by a $2.4 million grant from the National Institute of Dental and Craniofacial Research, Haythornthwaite is working with dental experts at the University of Maryland Dental School to evaluate whether a combination of pharmacological and psychological treatments for TMJ is better than either one alone in reducing pain and disability associated with the condition. Study participants from 18 to 65 who have had TMJ pain for at least three months randomly are assigned to take either the antidepressant nortriptyline — which has been shown to relieve TMJ pain — or a placebo once a day for eight months. Participants also randomly are assigned to receive either education about the condition or a series of cognitive-behavior therapy sessions with a psychologist for stress management. The therapy sessions use relaxation techniques to help participants break bad habits, says study co-investigator Michael Smith, an assistant professor of psychiatry at Hopkins. “We teach them to be more aware of what they’re doing, like clenching their teeth or biting pencils,” Smith says. About 80 percent of the participants have had treatment for TMJ before, says co-investigator Dr. Edward Grace, director of the Brotman Facial Pain Center at the University of Maryland Dental School. Thirty years ago, TMJ sometimes was treated by surgery to adjust the bite, but now conservative approaches are the standard, Grace says. These include application of moist heat, jaw exercises, over-the-counter pain relievers and relaxation techniques. There are three common TMJ diagnoses, Grace says: a muscular problem such as discomfort or pain in the muscles controlling the jaw; a functional problem such as a dislocated jaw or disc; or a degenerative joint disease such as arthritis in the jaw. The good news, he says, is that all three respond well to treatment. TMJ is a cyclical condition, Grace adds, and can flare up as a result of anything from a psychosocial event such as the death of a family member to a major change in diet. In a second Baltimore study, funded by an $800,000 grant from the National Institute of Neurological Disorders and Stroke, Smith is following 80 TMJ patients who have sleep disorders such as insomnia, sleep apnea and nighttime teeth grinding or clenching. The connection between sleep and TMJ pain has not been studied before, Smith says, even though at least 50 percent of TMJ patients report some kind of sleep problems. Either disorder, it seems, can cause the other. “A bad night’s sleep predicts pain, but pain can cause poor sleep,” Smith says. Why use Acupuncture to Treat the Temporomandibular Joint (TMJ)? While there are numerous ways to effectively treat temporomandibular joint (TMJ) disorders, acupuncture has been shown in several well-designed studies to be very effective and relatively safe. In a 2007 study, TMJ-related short-term muscle pain was significantly improved in people receiving acupuncture. A recent British study of 70 cases of dental patients receiving acupuncture for TMJ indicated that 85% of patients benefited with an average reduction in pain intensity of 75%. A 2008 study reported high long-term patient satisfaction and improvement of symptoms. Acupuncture may be used alone or in conjunction with other treatment approaches. Medications for TMJ disorders can include anti-inflammatories, analgesics (pain killers), muscle relaxants, as well as local injections of corticosteroids in severe cases, maybe recommended by your doctor or dentist. Acupuncture does not interact with these modern medical treatments and can often replace them as therapy without a their risks of side effects. Unfortunately, pharmaceutical treatments only provide symptomatic relief of temporomandibular joint (TMJ) disorders. However, acupuncture can target the root cause of the condition by balancing the mind and body through a network of energy channels called meridians, helping to reset the neuromuscular tension in the jaw. Often TMJ is due to underlying stress held in the jaw or contracted muscles in the jaw and face. Acupuncture can help to both relax these targeted muscles and decrease the overall stress level in the body to relieve TMJ discomfort. 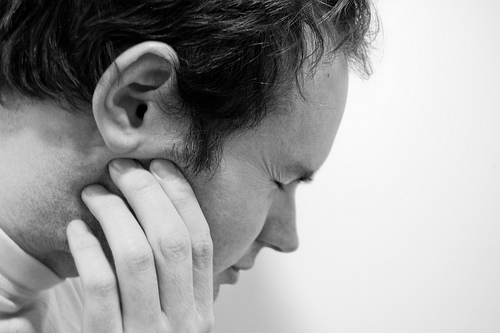 Long-term care of temporomandibular joint (TMJ) disorder requires important lifestyle changes. Dietary changes may be necessary, depending on any underlying health disharmony that may be identified by the acupuncturist. When teeth grinding or clenching is an issue, wearing a mouth night guard from your dentist can help prevent these actions in sleep. Bite plates can also help correct misalignment. Stress reduction, relaxation techniques, jaw stretching exercises, and modifying chewing habits are all behavioral approaches that have proved effective. Your acupuncturist can help guide you with these lifestyle changes to eliminate your TMJ discomfort. How Can Acupuncture Help the Temporomandibular Joint (TMJ)? Acupuncture has proven to be effective at reducing the pain associated with temporomandibular joint (TMJ) disorder. Modern research has revealed scientific reasons why acupuncture is a successful therapy: in the 1970s, reports appeared in Western medical literature suggesting that one way in which acupuncture reduces pain sensation is through direct stimulation of the nerve, which changes the quality of signaling along nerve cells. Further studies support this idea by demonstrating that acupuncture directly stimulates the release of endorphins and neurotransmitters, among other biological actions. These are naturally occurring substances that help dampen and block pain perception by the brain. Additional research is needed to further study the mechanisms behind acupuncture since many of acupunctures effects can still not be explained by either of these medical theories. Whether by affecting Qi or biological chemicals, what may be more important than the way in which acupuncture works for temporomandibular joint (TMJ) disorder is simply the evidence that it does work. As a long-standing treatment approach, research has even determined the recommended acupuncture points (ST-6, ST-7, SI-18, GV-20, GB-20, BL-10, and LI-4), frequency (weekly), and duration (30 minutes per session) of acupuncture treatment for TMJ-related problems. Needles may be inserted in the area of the pain, around the ear and the jaw. Or, because of the interconnecting pathways between the meridians, the needles may be inserted near the elbows, knees, and big toe; these distal locations can alter the flow of Qi flowing through the jaw to relieve pain and inflammation as well. Additional acupuncture points are to address other disharmonies detected in the body; correcting the overall flow of energy in the body can help relieve stress and other possible contributing factors to your TMJ disorder. Generally six acupuncture treatments are recommended, though a mild condition might be treatable in four treatments and chronic conditions may require more. While these treatments do lead to decreased pain, long-term treatment may be necessary to reeducate the muscles surrounding the temporomandibular joint (TMJ), preventing further complications. Complete treatment also necessitates working at the level of the cause, making lifestyle changes including posture, diet, dental work, and decreasing stress. Bergström I, List T, Magnusson T. A follow-up study of subjective symptoms of temporomandibular disorders in patients who received acupuncture and/or interocclusal appliance therapy 18-20 years earlier. Acta Odontol Scand. 2008 Apr. Vol. 66(2):88-92. Shen YF, Goddard G. The short-term effects of acupuncture on myofascial pain patients after clenching. Pain Pract. 2007 Sep. Vol. 7(3):256-64. Rosted P, Bundgaard M, Pedersen AM. The use of acupuncture in the treatment of temporomandibular dysfunction–an audit. Acupunct Med. 2006 Mar. Vol. 24(1):16-22. Rosted P. Practical recommendations for the use of acupuncture in the treatment of temporomandibular disorders based on the outcome of published controlled studies. Oral Dis. 2001 Mar. Vol. 7(2):109-15.